This is how we capture and band geese. OUR AIRBOAT PILOT spied a goose and swerved, accelerating over the water towards the lone bird. As we approached, the goose honked in surprise – or possibly avian outrage – and slipped underwater in an attempt to escape. Leaning over the bow of the airboat, I was able to pluck the bird from the water. He joined his fellow geese in a wooden containment crate strapped to the boat. Canada geese at the Harold Crane WMA. In mid-June, Canada geese in Utah are in the process of replacing their flight feathers, leaving them temporarily unable to fly. 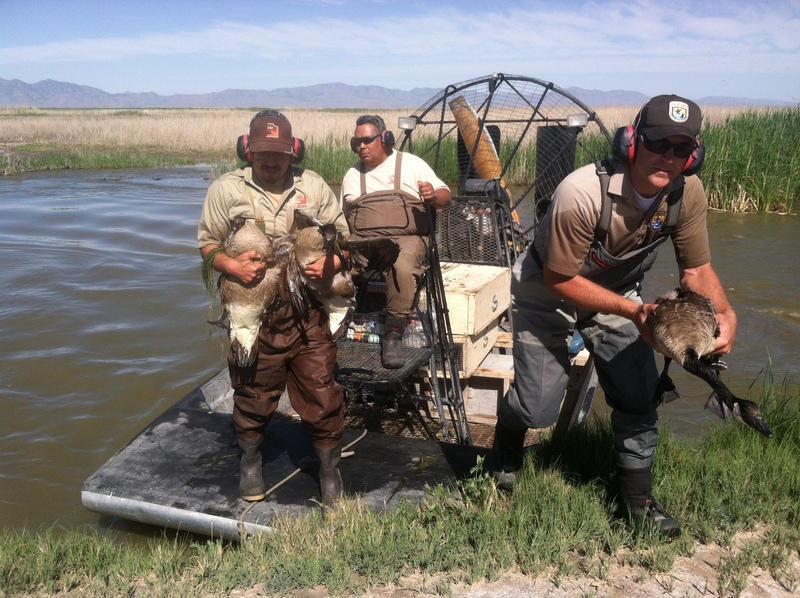 This makes them available to DWR waterfowl biologists and motivated volunteers. 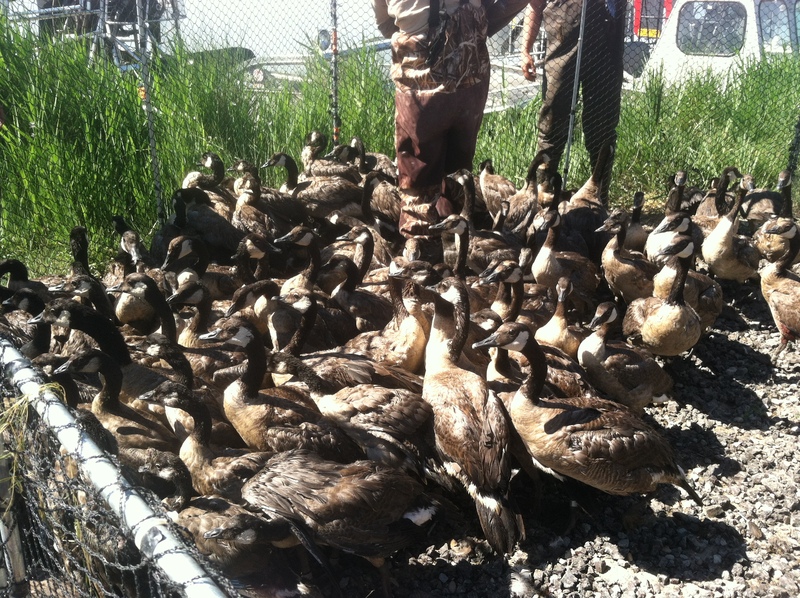 During this time, the DWR captures hundreds of adult and juvenile geese. The birds are fitted with leg bands which identify when, where and at what age they were caught. Geese are caught in two general ways: in urban settings, such as Lagoon Amusement Park, the birds are herded into corrals of soft mesh netting, or sometimes hand-caught by nimble technicians and volunteers. It sounds like a bit of a rodeo and it can be. Geese are often unwelcome in such urban locations, where they are free of natural sources of mortality. Canada geese have reached damaging or simply annoying densities in parks, greenbelts, airports and along waterways all over the country. To combat this, the DWR transports urban geese to undeveloped release sites. 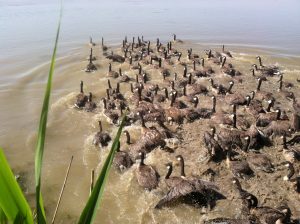 Juvenile birds are released with wild adults near the Great Salt Lake and adult geese are taken to more distant natural waterfowl habitat. Data from bands indicate most of the birds taken from urban locales and released in this fashion will return to the natural areas the following year, instead of coming back to befoul city lawns and parks. Returning to the shore in an airboat loaded with geese. In less civilized locations, such as the numerous duck clubs north of Salt Lake City or Farmington Bay, geese are captured using airboats. Geese are among the many seasonal visitors to north-central Utah’s expansive wetlands, along with Wilson’s phalaropes, American avocets, green and blue-winged teals, white pelicans, redhead ducks, ruddy ducks, black-necked stilts, white-faced ibises and black-crowned night herons. Because these geese do not pose problems to Utah residents or businesses, they are released on-site after banding. I could describe the process of catching geese utilizing airboats in technical terms: explaining the massive organizational effort to coordinate multiple government agencies, detailing the required piloting skill to simultaneously maneuver ten airboats through a maze of vegetation chasing agile geese without crashing into each other, describing the chaos of a dozen people sitting in a circle calling out band numbers to a harried scribe as another two dozen people stand waiting with an unbanded goose in each hand, or capture success relative to different models of airboat. Instead, I’ll simply say that the procedure is a lot of fun – a lot. Much like birdwatching in the wetlands, you can detect a capture operation by attentive observation. A long train of DWR trucks with trailers in tow can be spotted slowly driving along dikes in the wetlands. A number of agency people in waders can be seen applying bug spray as each truck deftly deposits an airboat into the water, then pulls away to provide a few inches of room for another truck on the crowded levy. As some boats are crewed and loaded, a few take off at high speed to push the geese away from areas where they can hide in thick vegetation or otherwise confound capture efforts. Each time an airboat leaves, people can be witnessed trying, unsuccessfully, to avoid the blast from the prop. 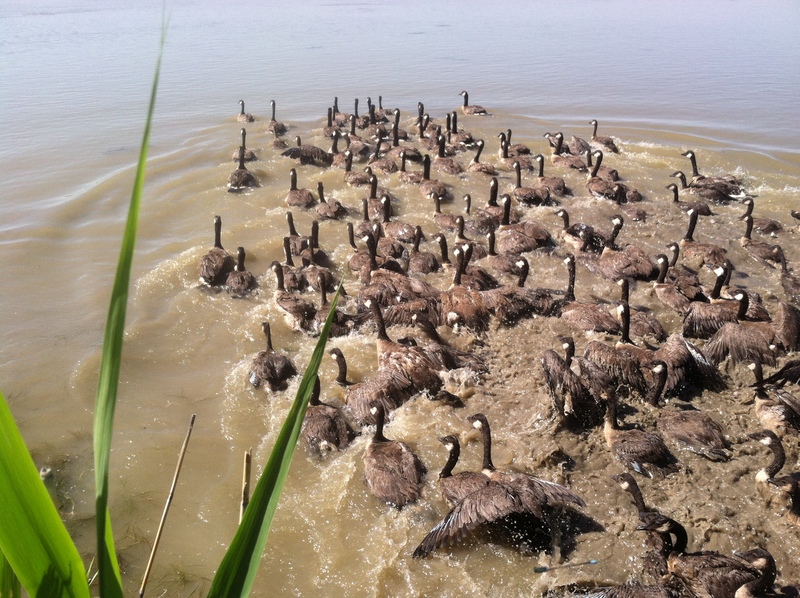 We often collect hundreds of geese at a single waterfowl management area. Once the operation is underway, crew members take turns laying down on the bow of the boat. The pilot searches from the elevated driver’s seat of the airboat, skimming over the water towards any detected geese. Upon seeing a pursuing airboat festooned with grabby humans, the geese dive under the shallow water to escape. Their underwater ‘flight’ leaves a trail of disturbed soil in their wake, allowing the pilot to follow them. Once close enough, the catcher leans out, plunges their hands into the water, and snatches a wet goose from among the streamers of green algae. Sometimes a goose is caught on the first try, sometimes a particularly wily bird requires more effort. The captured goose is handed to another crew member who places the goose into a wooden or plastic crate designed to hold the birds until the boat returns to shore. At one point, I found that my crewmate, Heather, had caught three juvenile geese at once – eclipsing my one-adult-at-a-time ability. I was in charge of placing these small geese into the crate, but handling those three without injuring them or letting them wiggle free while not falling out of a swerving boat was quite literally a balancing act. I hugged the juveniles to my chest, putting the heads of two angry geese and the tail feathers of one presumably confused goose in my face. Unlike the more fatalistic adults, these juvenile geese took this opportunity to attack me about the head and shoulders, biting me ineffectually but with great gusto. I suffered their ire, awkwardly clinging to the geese and the boat’s frame, until I could introduce the angry teens to the inside of the containment crate. When the boats have captured their maximum load of geese – our crates were full and Lynn, our pilot, had two geese in his lap when we finally stopped – the airboats head for a central location where skilled biologists apply the leg bands and record the data. With all the local geese caught, banded and released, the airboats are loaded onto trailers. If you listen carefully over the roar of their engines, you can hear people comparing their catch numbers as the train of trucks prepares to leave. << (Previous) What’s with the wipers? I am a PhD student in Connecticut, I am studying Canada geese. Are there any Canada geese that are allowed to remain in urban or suburban locations year round? Also is it known which subspecies of Canada goose that comprises these resident populations? A reviewer checks all comments before we post them. This might take a day or two, so please be patient. We will not post comments that contain links to other websites. IMPORTANT! To help prevent spam, please answer the math question above.